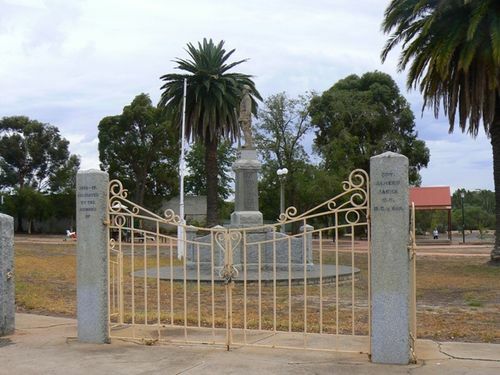 Gates at the entrance to the park commemorate local resident, Captain Albert Jacka, Victoria Cross (V.C. ), Military Cross (M.C.) and bar obtained during World War One. Albert Jacka, VC,MC & Bar(1893 – 1932) was an Australian recipient of the Victoria Cross, the highest decoration for gallantry "in the face of the enemy" that can be awarded to members of the British and Commonwealth armed forces. Jacka was the first Australian to be decorated with the VC during the First World War, receiving the medal for his actions during the Gallipoli Campaign. He later served on the Western Front and was twice further decorated for his bravery. Albert Jacka was born on a dairy farm near Winchelsea, in 1893, the fourth of seven children. His family moved to Wedderburn, Victoria when he was five years old, where he attended the local school before working with his father as a haulage contractor. He was working for the Victorian State Forests Department at Heathcote when the First World War broke out. His career over three years took him along the southern side of the Murray River to Wedderburn, Cohuna, Koondrook, Lake Charm and Heathcote. His work included fencing, fire break clearing and tree planting. Jacka is one of twenty employees shown on the Forests Department Roll of Honour.